Order this kit and receive the full physical issue of Interweave Knits, Winter 2015, featuring 21 Big-Knit patterns, and 6 balls of Tahki Yarn. This gorgeous cowl pattern is located in the magazine issue pages and exclusive Tahki Yarn color included in this kit is not available anywhere else. 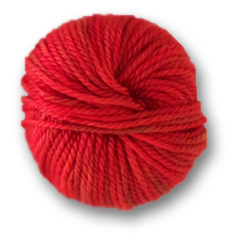 exclusive yarn color from Tahki Yarn! Fall in love with this knitted cowl! 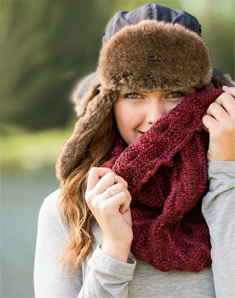 Featured on the cover of Interweave Knits Winter 2015, the Fall River Cowl is reversible and can even be worn as a hood. PLUS, this kit features an exclusive yarn color by Tahki Stacy Charles Yarn. 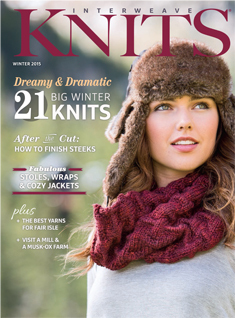 This issue of Interweave Knits Winter 2015 explores rugged refinement for winter with dramatic dusters, cardigans, and oversized wraps. Discover interesting texture patterns and bits of western colorwork embellish in the Outfitted collection, while sleek luxe fibers, oversized silhouettes, fitted silhouettes, cables, and feminine details characterize the Mulberry Cottage collection. Erica Shlueter developed the stitch pattern for the Fall River Cowl while playing with welting techniques. The result is a reversible fabric with lots of dimension, and the size is generous enough to be pulled up as a hood. Gauge: 14 sts and 22 rows equal 4" St st.
Charly Print Melange in St. Mel Rosso by Tahki Stacy Charles Yarn is an exclusive color made specifically for this kit. It is unavailable online and not sold anywhere else. Each kit contains 6 balls of Charly Print Melange in 1011 St. Mel Rosso, which is enough yarn to knit one Fall River Cowl. *Colors may vary from what is picture here. Order the Fall River Knitted Cowl Kit today!